Phillip Dodd rides Possum into a placing in the D Grade final at Sale, 2006. This Celerity Park mare came to us from Bec Seckold as a green D Grader with lots of scope and a bit of a feisty attitude. The attitude softened over time, and the scope remained. 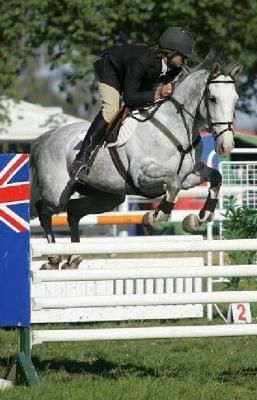 Possum and Julia placed regularly in huge D Grade classes, and they won the D Grade at the State Championships in 2005 with a scorching time in the jump-off. Phill Dodd then won the Young Rider Championship riding Possum at Bega later that year, a fitting end to his Young Rider career. Possum went to a young rider in training with Grant Hughes shortly after her success in Bega.